USE OF THIS TICKET CONSTITUTES ACCEPTANCE OF ITS TERMS. YOU HEREBY ACKNOWLEDGE THAT MOTOR RACING, THE eVENT AND CERTAIN ACTIVIES ASSOCIATED THEREWITH ARE DANGEROUS. PARTICIPATION IN THIS EVENT IS AT MY OWN RISK AND COMES WITH RESPONSIBLITIES. By use of this ticket and/or other event admission material, I am agreeing to each and all of the following terms. I expressly assume all risk incident to the event, whether occurring prior to, during or subsequent to the actual conduct of the event. I HEREBY RELEASE all event participants, Circuit of The Americas (“COTA”), sanctioning bodies, INDYCAR, LLC ("INDYCAR"), and their officers, directors, members, owners, successors, assigns, agents, employees, representatives, and affiliates from any and all claims arising from the event, including claims of negligence of released parties. By use of this ticket and/or other event admission material, I am agreeing to each and all of the following terms. Motor racing is dangerous and noisy. The inherent risks posed by this event and related activities include, but are not limited to, flying debris and other hazards resulting from collisions, reckless or violent acts committed by event attendees, and failure or unsuitability of facilities—such as grandstands, barriers or railings—to protect persons and property from harm. If you are a parent or guardian accompanying a minor, by allowing the minor to attend the track, you are deemed to have given all of the foregoing grants of rights, releases, and waivers on such minor’s behalf. If you do not wish to or are not authorized to grant such rights, releases, and waivers on behalf of such minor, the ticket holder should immediately accompany the minor out of the track/venue. I grant COTA, INDYCAR, and its designees the right to use my image and/or likeness in any live or recorded video display or other transmission or reproduction of the event, including without limitation my rights of publicity. All rights to broadcast, record, photograph, repeat, reproduce or recreate the event are reserved by INDYCAR. I agree not to take any action, or cause others to take any action, which would infringe on the rights of COTA, INDYCAR or its designees. COTA and the other entities and persons listed above are not responsible for conditions or events outside their reasonable control, including, but not limited to, inclement weather or transportation problems. You assume sole responsibility for your transportation to and from the COTA venue. You must abide by our rules and regulations available at http://www.circuitoftheamericas.com. A guideline of acceptable and prohibited items and activities are also listed. Your bags, purses, backpacks and persons are subject to screening by security personnel at their discretion. Dates, programs, seat allocations are all subject to change. Booking charges are non-refundable. Tickets are non- transferable and not for resale. For security measures, you may be refused admission to, removed from the venue, and filmed by CCTV for any violation of facility rules, apparently unlawful behavior, disruption of the event, or any other reason at the sole discretion of COTA, its employees and agents, or other event staff. Animals and articles that compromise public safety are not permitted. Tickets should only be purchased through authorized agents. Tickets obtained from sources other than COTA or its authorized agents will not be honored. If a ticket is resold or transferred for profit or for commercial gain (including as part of a promotion or prize) without COTA’s authority it will become void and the holder may be refused entry to or ejected from the Venue. Illegible tickets shall be void. Resale or an offer to resell tickets at any price while on the premises of COTA, or any other property owned by COTA is strictly prohibited. Complimentary tickets not exchangeable or redeemable for any benefit offered to tickets with a dollar value. You must always keep to the designated paths and steps. You must comply with all instructions given by any official. No person may use the name of the Event or part thereof (nor any abbreviation or foreign language version thereof) nor any logo or graphic device of or relating to the Event for any advertising, promotion, or other trade purposes without the prior written consent of COTA. These terms and conditions shall be governed by the laws of Texas. THIS TICKET IS A REVOCABLE LICENSE TO ATTEND THE EVENT LISTED ON THE FRONT OF THE TICKET. 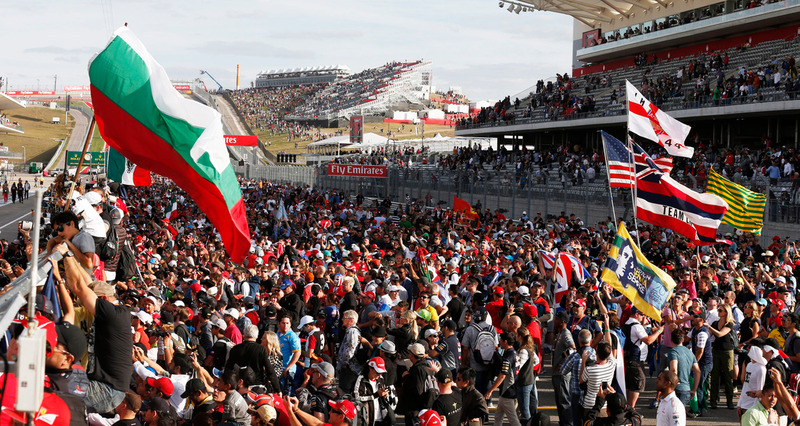 YOU ARE NOT ENTITLED TO A REFUND, REPLACEMENT TICKET AND/OR OTHER EVENT ADMISSION MATERIAL OR TO PAYMENT FOR ANY DAMAGES OF ANY KIND FOR ANY REASON FROM COTA OR INDYCAR, INCLUDING WITHOUT LIMITATION CANCELLATION, SHORTENING OR OTHER ALTERATION OF THE EVENT. TICKET IS ONLY VALID FOR EVENT AND SEAT PRINTED ON TICKET. THIS TICKET IS ALSO SUBJECT TO ALL TERMS OF ITS ORIGINAL SALE. YOU HEREBY ACKNOWLEDGE THAT MOTOR RACING, THE EVENT (“MOTOGP”) AND CERTAIN ACTIVITIES ASSOCIATED THEREWITH ARE DANGEROUS. Participation in this racing event and all related activities, whether occurring prior to, during, or subsequent to the event, as a spectator is AT YOUR OWN RISK, and HEREBY RELEASES sanctioning bodies, Circuit of The Americas (“COTA”), Dorna Sports S.L. (“Dorna”), Federation Internationale de Motocyclisme, IRTA, organizers of the Event (including officials, marshals, rescue, medical staff), competitors and drivers, all directors, member officers, shareholders, owners, affiliates, employees, agents, servants, representatives and contractors thereof, each of the foregoing, or any other entity connected with the organization of the Event for any personal injury, death, damage or loss of any kind that the Pass Holder may suffer or sustain, or cause as a result of or in connection with the Pass Holder’s presence at the event. Motor racing is dangerous and noisy. The inherent risks posed by this event and related activities include, but are not limited to, flying debris and other hazards resulting from collisions, reckless or violent acts committed by event attendees, and failure or unsuitability of facilities—such as grandstands, barriers or railings—to protect persons and property from harm. If you are a parent or guardian accompanying a minor, by allowing the minor to attend the track, you are deemed to have given all of the foregoing grants of rights, releases, and waivers on such minor’s behalf. If you do not wish to or are not authorized to grant such rights, releases, and waivers on behalf of such minor, the ticket holder should immediately accompany the minor out of the track/venue. Any photographs or recordings shall not be used for any form of public advertisement or display or for any purpose (except private purposes) without Dorna’s or COTA’s written consent. For good and valuable consideration, which receipt is acknowledged, the ticket holder grants Dorna and the Circuit and their designees the right to use his/her image and/or likeness in any live or recorded display or other transmission or reproduction of the event, including without limitation to his/her rights to publicity and/or commercial exploitation. All rights to broadcast, record, photograph, repeat, reproduce or recreate the event are reserved to Dorna and COTA. The ticket holder agrees to not take any action, or cause others to take any action, against Dorna and/or the Circuit. The ticket holder agrees to submit to the conditions established in this ticket and to the ones displayed at the Circuit’s entrance. You must abide by our rules and regulations available at http://www.circuitoftheamericas.com. A guideline of acceptable and prohibited items and activities are also listed. Your bags, purses, backpacks and persons are subject to screening by security personnel at their discretion. Dates, programs, and seat allocations are all subject to change. Booking charges are non-refundable. Tickets are non-transferable and not for resale. For security measures, you may be refused admission to, removed from the venue, and filmed by CCTV for any violation of facility rules, apparently unlawful behavior, disruption of the event, or any other reason at the sole discretion of COTA, its employees and agents, or other event staff. Animals and articles that compromise public safety are not permitted. THIS TICKET IS A REVOCABLE LICENSE TO ATTEND THE EVENT LISTED ON THE FRONT OF THE TICKET. YOU ARE NOT ENTITLED TO A REFUND, REPLACEMENT TICKET OR TO PAYMENT FOR ANY DAMAGES OF ANY KIND FOR ANY REASON, INCLUDING WITHOUT LIMITATION THE DELAY, POSTPONEMENT, CANCELLATION, SHORTENING, OR OTHER ALTERATION OF THE EVENT. TICKET IS ONLY VALID FOR EVENT AND SEAT PRINTED ON TICKET. YOU HEREBY ACKNOWLEDGE THAT MOTOR RACING, THE EVENT AND CERTAIN ACTIVITIES ASSOCIATED THEREWITH ARE DANGEROUS. Participation in this racing event and all related activities, whether occurring prior to, during, or subsequent to the event, as a spectator is AT YOUR OWN RISK, and HEREBY RELEASES sanctioning bodies, Circuit of the Americas (“COTA”), organizers of the Event (including officials, marshals, rescue, medical staff), competitors and drivers, and all directors, shareholders, owners, affiliates, employees and agents of each of the foregoing from any and all claims arising from the event, including negligence of releasees. Motor racing is dangerous and noisy. The inherent risks posed by this event and related activities include, but are not limited to, flying debris and other hazards resulting from collisions, reckless or violent acts committed by event attendees, and failure or unsuitability of facilities—such as grandstands, barriers or railings—to protect persons and property from harm. If you are a parent or guardian accompanying a minor, by allowing the minor to attend the track, you are deemed to have given all of the foregoing grants of rights, releases, and waivers on such minor’s behalf. If you do not wish to or are not authorized to grant such rights, releases, and waivers on behalf of such minor, the ticket holder should immediately accompany the minor out of the track/venue. All rights to broadcast, record, photograph, repeat, reproduce or recreate the events are reserved to COTA. Any photographic display, live or recorded audio, or video or any other type of transmission, exhibition or reproduction made of, or at, the events shall not be used without COTA’s consent. Your entry to the facility grants permission to COTA and their affiliates (and their respective licensees and agents) to utilize your image, likeness, actions and statements in any of the aforementioned types of media.